By Blo on June 13, 2017 in Blo Hearts its Stylists! “Angela Palmer so easily and clearly embodies the phrase, “the cream rises to the top.” This stellar woman has been by my side for the last year and never wavers in her excellence and commitment to Blo. 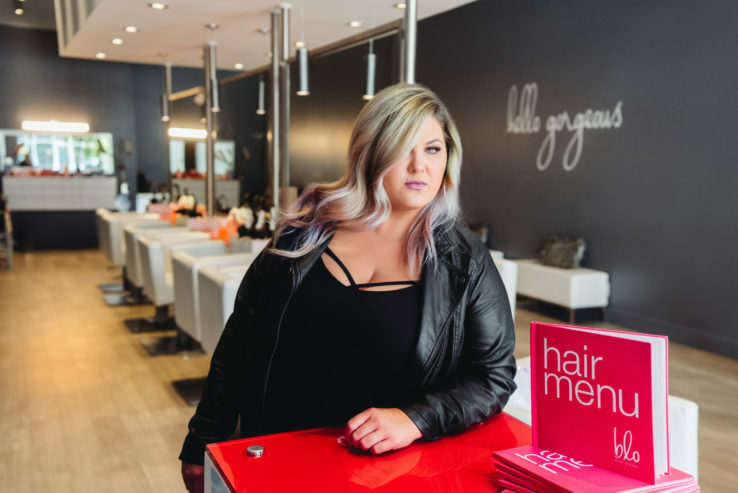 Angela moved from Bloer to Style Boss to becoming my very first Bar Boss and is now my District Manager for both Blo The Woodlands and Blo Montrose. Her talent with styling and her knowledge of Blo (and all aspects of the business, truthfully) far exceeds any other stylist that we’ve ever employed. Her professionalism and desire to teach and mentor other stylists is unmatched. I’m excited to see what Angela is able to achieve for herself and both of our Blo locations and I’m thrilled that Blo Corporate sees the greatness in her that I see every day. Where do I begin? The culture and vibe are what hooked me from the beginning. But I also love the recognition and appreciation, my team, our clientele, getting to be creative and do what I love everyday. The list is endless, really! Trends and styles are always changing. Therefore, there is always something new and exciting to learn! I also love making people feel good about themselves. Having a client cry tears of joy in your chair when they see the finished product is an indescribable feeling! Be confident in your abilities as the professional behind the chair. Also, you never know what someone is going through. Everyone has a story. Treat everyone with respect and listen. This may date me, but Alicia Silverstone in the movie Clueless! Her hair is everything! I’m actually convinced I was born with it. I can remember always having my hands in someone’s hair as a child. I’ll never forget the day I taught myself how to braid on my Barbie mannequin head…I was 5! My children. They are my reason. Seeing how proud they are of me, and hearing, “Wow Mommy, you did that?” anytime they see my work makes all the hard work and time away from them worth it! I’m obsessed with all things Disney. I’m pretty sure I enjoy Disney movies more than my children do. Which celebrity would you love the chance to blo away? Sandra Bullock. She is one of my favorites and she has great hair! Which product can’t you live without at your station?/in your tool belt? If you could gift a blo to someone who would it be? There have actually been two instances recently where I have gifted blow outs. One was for a mother whose baby passed away. The other was for the wife of an Ironman athlete who died of a heart attack during the race. Both were attending the funerals of their loved ones and it was the least I could do for them.